For Ukrainian scholars attending this week’s conference at Notre Dame’s Rome Global Gateway, the topics to be discussed became lived realities over the past year—realities that led to civil disobedience, public protests, and the loss of a colleague who was killed by a sniper while protesting in February 2014. Rev. John I. Jenkins, C.S.C., issued a statement of support for these protesters in December 2013. Sources of the Civic a conference organized by the Nanovic Institute for European Studies, is set to address competing conceptions of civic education and the unique role that Catholic universities play in cultivating the virtues, values, and responsibilities central to the healthy exercise of civic life. 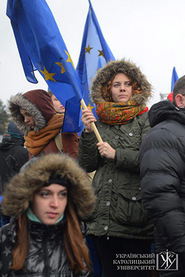 Taras Dobko and Volodymyr Turchynovskyy, both professors at Ukrainian Catholic University, report that UCU students were among the first to protest in November 2013 when the Ukraine government decided not to sign the European Union Association Agreement. “On December 11, 2013, the university publicly declared civil disobedience to President Yanukovych and his government,” they said. “Many UCU students, professors, and staff spent countless days on the Maidan in Kiev, having volunteered for services there.” Three months into this conflict, a sniper shot their colleague, Bohdan Solchanyk. Dobko and Turchynovskyy believe that in response to such times of turmoil, the role of the Catholic university is to help “voice the people’s aspirations for dignity, justice, transparency, and rule of law.” UCU’s leadership specifically worked to prevent escalation of the conflict by establishing channels of communication between the government and opposition. “Civic education is eventually about witnessing that care for and solidarity with the Other in pursuing the common good aren’t just empty slogans; they are realities that shape our lives,” they said. That the conference convenes in Rome is likewise significant. “We have an excellent venue for expressing Notre Dame’s global commitment to the civic values of Catholic education, especially in times of political unrest,” said Theodore Cachey, Notre Dame International’s newly appointed director of the Rome Global Gateway and professor of Italian.